Last week I asked my baby sister to list her favorite colors, I wanted specifics, down to her favorite shade of each. For the last several years I've made her something for her birthday, a tradition I'm happy to continue! 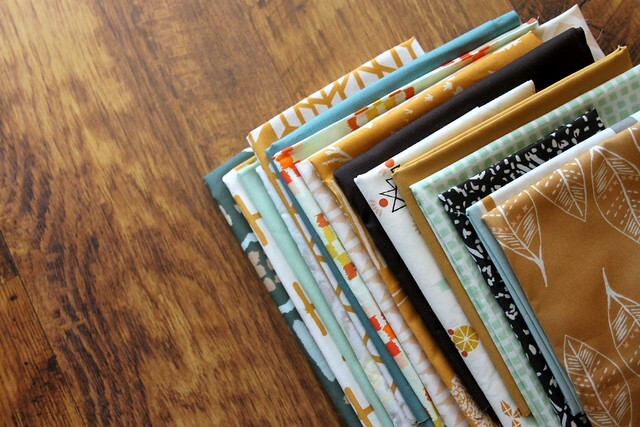 Searching my stash for her colors -- Mustard yellow, deep turquoise, light gray, pale greens, and Earthy browns, had me reaching for April Rhodes' fabric once again. I settled on making a pillow, a mini version of a quilt pattern I plan to share soon. 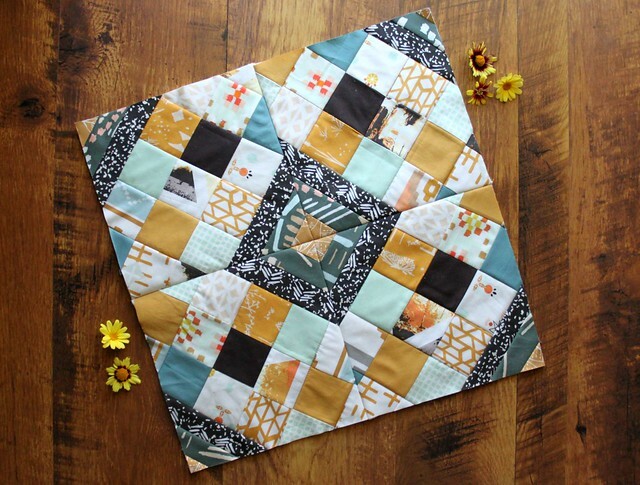 The patchwork design and fabrics paired up perfectly! I loved it so much that if I had the time, I would have loved to make a quilt. While I sewed, my husband and kids were at the nearby river. When I joined them with my finished pillow and camera I was amazed to see what they had created together! 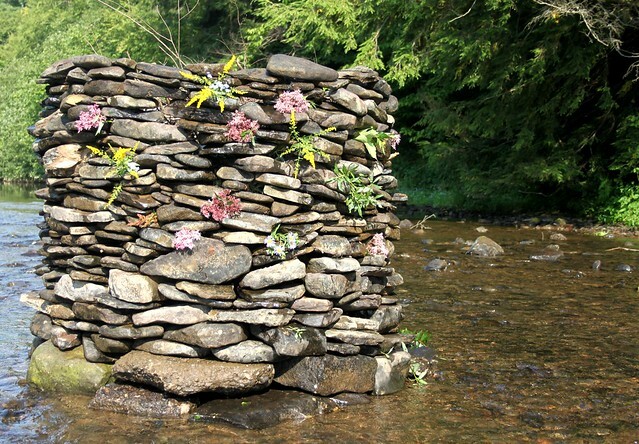 Ending the Summer with a river rock sculpture is a tradition my husband started a few years ago. It was beautiful to see Haila decorating their project with wildflowers, something I had done in previous years. 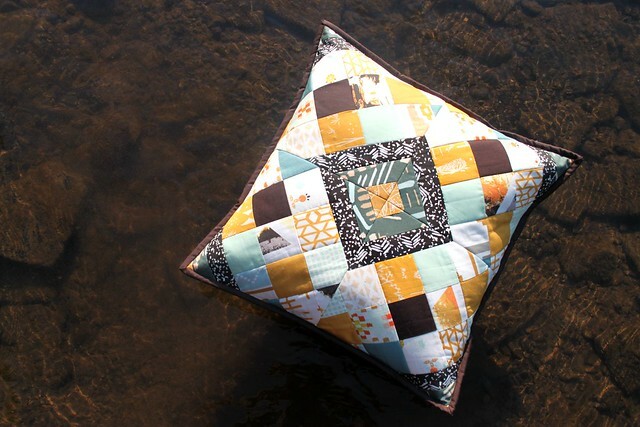 I took photos of my finished Birthday pillow, sitting just above the moving water! My sister loved her pillow. It truly is a blessing to have so many to make for. Continuing these creative family traditions is a beautiful thing! Love your fabrics, and the pillow is so cute. Thanks for sharing. The pillow is beautiful as is the rock sculpture. What wonderful traditions, sewing something for your sister and making the sculpture. Love your pictures! It's a lovely pillow! 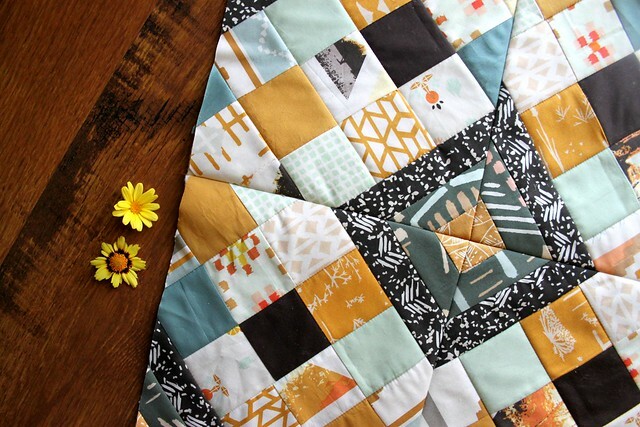 Can you share when your quilt pattern is ready? I think you really picked her colors perfectly! Awesome!! We might have to take a walk down to see it. I'm sure Biz will love the pillow...amazing. Heartwarming post with beautiful pics! The pillow for your sister is great, and making rock sculptures together, sounds like a lovely tradition! Maureen, I loved reading your post. It was relaxing and filled with beauty. 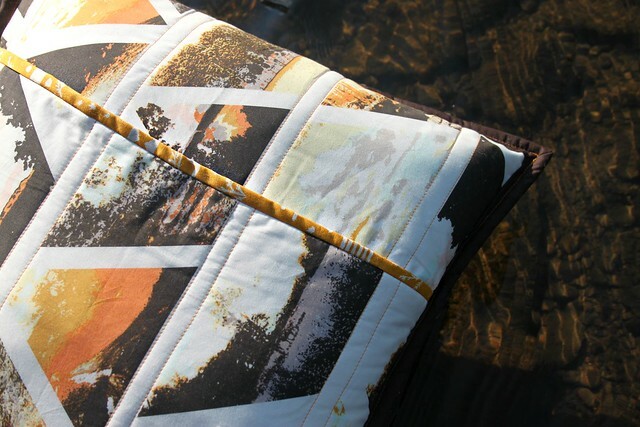 I especially loved the photo of your pillow floating on the water....really brilliant idea. 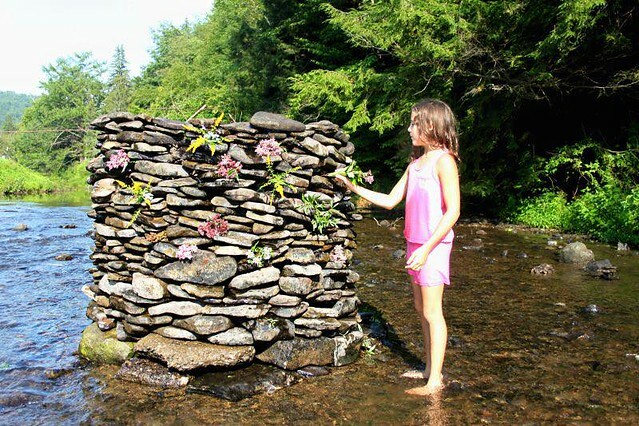 Also, the rock sculpture is another fantastic idea for a family tradition that involves everyone and enhances so many skills. The fabrics you chose for your pillow are spectacular. Thank you so much for sharing. Have a wonderful creative day! Loving this pillow. Can you explain how you did the back? Is it an envelope closure or a zipper? I love the pillow! I have to say though, the sculpture, while pretty, is harmful to the river. It disrupts the flow of water, damages the bed and destroys habitats.